EXCELEBRATION (IRE) (Bay 2008-Stud 2013). 8 wins-2 at 2, Ascot Queen Elizabeth II S., Gr.1. Half-brother to SW Lancaster Bomber. Sire of 282 rnrs, 158 wnrs, inc. SW Barney Roy (Royal Ascot St James's Palace S., Gr.1), Speak in Colours, Rebel Assault, Saint Patricks Day, Tilly's Chilli, SP Exceltic, Hey Jonesy, The Conqueror, Fulminato, Pellucid, Siberian Iris, Inverleigh, Strike Celebration, Istan, Lincoln, Liwanu - Cheerful Star (H.K. ), etc. Another Prayer. 3 wins from 1800m to 2000m, A$82,140, ATC McGrath Estate Agents Principals H., 3d ATC Built H.
Radiant Splendour. 2 wins at 1150m, 1400m in 2017-18, Turffontein Mobile Betting at Its Best Novice H.
Mon Bel Ami. 2 wins at 1300m, 1350m, A$78,515, 2d ATC Anzac Day H.
Certain Shine (g. by Not a Single Doubt). 3 wins from 1400m to 2100m, TTC Balmoral on York H., TRC Waratah Hotel P., 2d TRC Doctor Syntax Hotel H., 3d TTC Stallards Camera House H., Power & Automation H., TRC Graham Family Funerals P.
Defective (g. by So You Think). 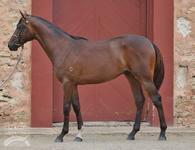 Winner at 1200m, BRC Cellarbrations P., 2d Ipswich TC Sirromet H.
Lucia (f. by Encosta de Lago). Winner at 1650m, BRC Gallopers $1 Membership P.
Spherical (g. by Encosta de Lago). Winner at 1600m in Aust. Curragh Cailin. 3 wins at 1000m in Aust. Maybe the One. 2 wins-1 at 2-at 1100m, 1400m in Aust. Flying Seba. 2 wins at 1400m, 1600m in Aust. STARSPHERE (Celestial Bounty). 9 wins. See above. Captain Smooth. 15 wins from 1200m to 2200m, A$135,820, QTC Orianda H., Brassed Off H., Rough Habit H., 2d QTC Trentham H., Contere H., 3d QTC Vo Rogue Welter H., Waterford Wedgwood H., SSL Spotless H., Bern Maid H., Hayai H.
Skinner's Revenge. 4 wins from 1200m to 1600m, 3d BTC Covers Valentines Day H.
Moonlight Matilda. 2 wins at 1000m, 1200m in Aust. Rebel Duel. 4 wins to 1300m in Aust. Bima Sakti. 2 wins at 1200m, 1600m in Malaysia. Mighty Perfection. Winner at 1300m in Aust. Moonlight Rebel. Winner. See above. PRINCE GRANADA (Lucky Monkey). 8 wins-3 at 2-from 900m to 2000m, A$78,060, AJC Breeders' P., Gr.3, Adam Lindsay Gordon Welter H., Hoxton Park H., STC Bentinck H., Family Circle H., Sceptre Colour TV Welter H., Summer Sale Welter H., 1900m-in track record time, Nijinsky Welter H., 2d STC Silver Slipper S., Gr.2, Parramatta Cup, L.
Aussie Battler. 6 wins from 1300m to 1600m, STC Santa Anita H.
Rebel Line. 2 wins. See above. Racetrack Blues. 12 wins-2 at 2-from 1000m to 1600m in Aust. Soft Line (Honey Line). 4 wins. See above. Forgive. 30 wins from 1m to 1¼m, ACT RC Canberra Cup. Persian Chimes (Persian Lyric). 16 wins from 1100m to 2200m, BATC Handicap, QTC Handicap-twice, 3d QTC JHS Barnes S., L.
Race Record: 4 Starts 0-0-0 A$425.